It packs 1GHz Dual Core CPU on board which is sufficient for average usage. There is just 512 mb RAM. 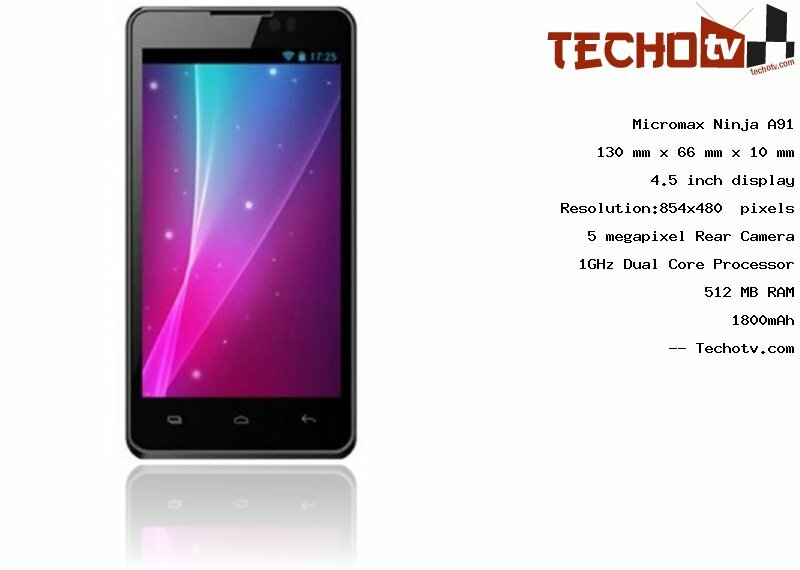 The screen resolution of Micromax Ninja A91 phone is 854*480 pixels and the display is of 4.5 inch. The total pixel count leads to density of 218 ppi. It measures 130 mm x 66 mm x 10 mm. It has internal memory capacity of 4 GB. The primary camera at the back of device is of 5 megapixel. There is 0.3mp VGA camera at front for video-calling and other needs. The Price of Micromax Ninja A91 is Rs 8499. More pricing details from different online stores are not available at the moment.